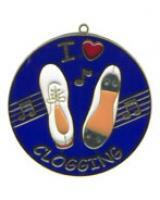 Here's a great salute to all those folks out there involved in the heritage known as clogging. Let everyone know how you feel about double-step-rock-step! This suncatcher is 4.5" x 4.5" with white shoes, a blue background, silver taps, and appropriately colored soles and heel.